The goal of gene therapy research is to determine whether a new gene can be used to replace or inactivate a mutated gene to treat or possibly prevent a genetic disease. Gene therapy’s focus on the eye. In the case of inherited retinal diseases (IRDs), researchers are striving to develop gene therapy treatments to deliver a functioning copy of one specific mutated gene directly to the retina. The hypothesis? Once the body has this functioning copy of the gene, it should restore the production of the necessary protein or stop the production of the harmful protein. Using viral vectors to deliver a copy of a healthy gene. One way researchers deliver a healthy copy of the gene to a patient's retinal cells uses a carrier, called a vector. Some of the most common vectors are made from altered viruses. Viruses are commonly used as vectors because of their natural ability to enter specific cells. Exploring the potential of gene therapy. For gene therapy to work, a transporter, called a vector, is typically used to deliver the healthy copy of the gene into the cell. See how science hopes to leverage these vectors. To create a viral vector, scientists modify a virus by removing its viral genes and replacing those gene with a functioning copy of a gene from the targeted tissue. Once the virus has been modified, it is intended to transport the desired gene to a cell without causing disease. The viral vector is introduced into a specific tissue, for example, that of the retina, where it delivers the functional gene into target cells. Once the cell has received the functional gene, it should address the mutation by producing the necessary protein or stopping production of the harmful protein. The importance of genetic testing. Gene therapy’s power lies in specificity. That’s why genetic testing to try and determine the mutation responsible for your vision loss has become so important for anyone with an IRD. Knowing your genetic mutation is key to understanding what this exciting research potentially means for you. Answers to your genetic testing questions. As research progresses in the field of gene therapy, it's more important now than ever before that individuals with IRDs get genetically tested. Our understanding of inherited retinal diseases is changing quickly. 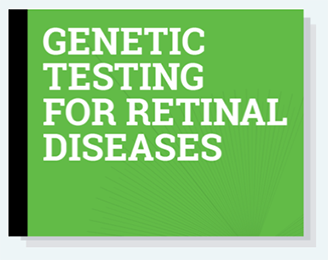 Sign up to receive news of advances in retinal gene therapy research.